Korea Foundation Associate Professor of History, Eugene Y. Park said that many Koreans seem to have a genealogical memory blackout before the twentieth century. According to him the vast majority Koreans do not know their actual genealogical history. Through "inventing tradition" in the seventeenth and eighteenth centuries, families devised a kind of master narrative story that purports to explain a surname-ancestral seat combination's history to the extent where it is next to impossible to look beyond these master narrative stories. He gave an example of what "inventing tradition" was like from his own family's genealogy where a document from 1873 recorded three children in a particular family and a later 1920 document recorded an extra son in that same family. Park said that these master narratives connect the same surname and ancestral seat to a single, common ancestor. This trend became universal in the nineteenth century, but genealogies which were published in the seventeenth century actually admit that they did not know how the different lines of the same surname or ancestral seat are related at all. Only a small percentage of Koreans had surnames and ancestral seats to begin with, and that the rest of the Korean population had adopted these surname and ancestral seat identities within the last two to three hundred years. ^ a b c d e f g h i j k l m n o p q r s t u v w x y z aa ab ac ad ae af 재외동포현황(2017)/Total number of overseas Koreans (2017). South Korea: Ministry of Foreign Affairs. 2017. Retrieved 28 August 2018. ^ Wang, Yuchen; Lu, Dongsheng; Chung, Yeun-Jun; Xu, Shuhua (2018). "Genetic structure, divergence and admixture of Han Chinese, Japanese and Korean populations". Hereditas (published 6 April 2018). 155: 19. doi:10.1186/s41065-018-0057-5. PMC 5889524. PMID 29636655. 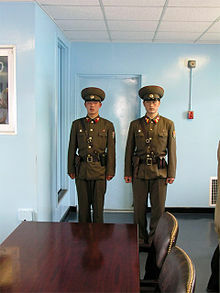 This article incorporates public domain material from the Library of Congress Country Studies document "North Korea: A Country Study" by Savada, Andreas Matles, ed. (1994). Retrieved on 27 July 2013. Fourth ed. Washington: Federal Research Division of the Library of Congress. ISBN 0-8444-0794-1.